In the construction industry, deadlines are a way of life. Whether you are meeting proposal deadlines, managing costs, minimizing weather delays, meeting contract requirements, etc., the clock seems to always be ticking and pressure is continually mounting. However, recently EagleLIFT performed a culvert soil stabilization and slope repair project at Vandenberg AFB that, if not met, the deadlines would be a costly scenario. Vandenberg AFB is a Department of Defense space and missile testing base located near Lompoc, California. Vandenberg launches a variety of critical rocket missions for military purposes and also leases launchpad facilities to SpaceX. As you can imagine, its activities are high-profile, high-budget, and highly sensitive to delays. During the 2016-2017 rainy season, Vandenberg experienced extensive storm runoff that damaged an 84 inch, 200ft long corrugated metal drainage culvert, causing collapse at three separate locations and further degraded the culvert’s corroded bottom. The damage to the culvert caused severe inflow and infiltration (I/I) which destabilized an adjacent slope along the main supply road leading to Space Launch Complex 6 (SLC-6). When an approximate 30ft deep sinkhole opened up by the supply road, a bypass road had to be installed in order to continue launch operations until a permanent fix was designed for the culvert. When concern began to grow that a 20ft high section of the adjacent slope would slip and the sinkhole wound endanger the new bypass road and delay an upcoming $1.5 billion mission, Vandenberg sought for a temporary fix to strengthen the culvert, slope and avert disastrous and costly delays. When Vandenberg began designing a repair, the solution was to address 1.) culvert soil stabilization and restoring usable capacity, 2.) ensuring the slope would not slip, and 3.) not impact the environmentally sensitive habitat on the slope. For the culvert soil stabilization, the AFB determined that chemical grout would be used to stabilize collapsed sections from degrading further into the culvert. The entire culvert was to be stabilized to prevent further soil migration and seal it against further I/I, and the corroded bottom of the CMP would be restored using a flowable fill. For the slope, a “wedge” injection pattern was designed to provide structural stability at the bottom of the slope and lateral stability to prevent slippage that would cause structural damage to the culvert and irreparable damage to the sensitive environment the slope supports. Based on these concerns, the slope “wedge” injections were rescoped to utilize a specialized formula of chemical grout that was hydroinsensitive, light-weight and highly expansive. The material’s initial permeation and structural capacity gave Vandenberg confidence in this alternative. To meet the environmental compliance needs of the project, extensive preparations were necessary to minimize potential delays and protect endangered species that called this site their home. Some of the species included California Buckwheat, El Segundo Blue Butterflies, Tar Plants and the Red-Legged Frogs. To ensure the endangered plant/wild life habitat wasn’t inadvertently violated, environmentalists were onsite to pre-mark the plant life and be on the lookout for wildlife. If any of these species were disturbed or damaged, the project could have seen an immediate shutdown. In regards to the culvert, EagleLIFT stabilized its entire 200 ft length. At the crushed joints, a 2ft injection of chemical grout created a thick arch of material and densified aggregate. The arch was designed to provide a convex, dense structural layer that would help provide structural stability and reinforcement to the crushed CMP. This would help mitigate further damage from occurring and re-establish limited drainage capacity. The remaining portions of the culvert were stabilized using a consistent gridded injection pattern. The goal here was to fill any annular voids and restore the bearing capacity of the adjacent support soils. The terms of the project were to complete the project in a 30-day window, spanning from September 14 – October 14, 2017. The project was completed in 8 days with no delays or adverse environmental impacts. EagleLIFT has offices in Ontario, CA, Concord, CA, Las Vegas, NV and Rialto, CA. EagleLIFT is a Class “A” General Engineering Contractor and holds SB, SBE and DVBE certifications and services Arizona, California and Nevada. The Rainy Season is Here, Are Your Flood Control Structures Ready? The challenge for managers of water control structures is determining what kind of maintenance needs to be done to prepare for the rainy season. 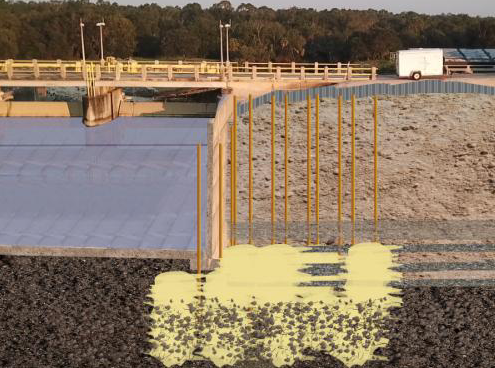 Over our 20-year history, we have evolved the use of chemical grout in flood control structure rehabilitation and seepage barrier repair, reducing manager’s costs and construction timelines. So, what are some applications that chemical grout can be utilized to help you prepare for this rainy season? Chemical grout is a two part highly expansive polymer that is used to void fill and stabilize soils. Due to its highly expansive nature, hydro insensitivity, and strength, chemical grout is highly effective for stabilizing water control structures and protecting them against water seepage and erosion. Once injected chemical grout expands up to 20 times its initial volume. When the grout enters the treatment zone it is initially in liquid form. Like water, it saturates the area finding the path of least resistance. Once expansion begins, the material begins to permeate the soil, filling any annular voids throughout the soil and below the structure. Depending on the project goals, this process can be used to fill voids, soil stabilization, and restore or increasing the bearing capacity of base foundation soils. If there is any present water, the polymer will displace it and push it away. Due to the chemical grout’s hydro-insensitivity and its binding of soils, the process will mitigate future washout and erosion. Chemical Grout is fast, efficient, light-weight and cost-effective. Fast – Chemical Grout sets up to 95% within 15 minutes after injection. The results are immediate and the facilities operations are virtually unaffected. Efficient – Moisture content isn’t an issue for chemical grout. Because of this, no matter the soil conditions, chemical grout can be used. Additionally, EagleLIFT has over 20 years of experience in directing its injection patterns to ensure the project goals are a success. Cost-effective – because it takes less of our material, less time and low project footprint, using our polymers is significantly more cost-effective than the competition. Safe – Our products are NSF-61 certified, to make sure we have no impact on environmentally-sensitive areas or drinking water supplies.